General Assembly 2017 for the Unitarian Universalist Association was one of growing pains. For some reason, New Orleans had never been on my radar as somewhere to visit. 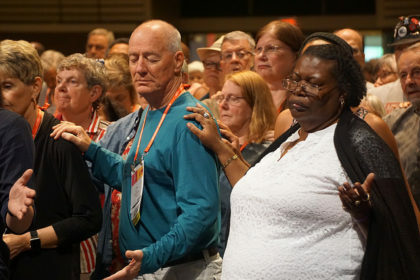 When the Unitarian Universalist Association announced that our General Assembly would be in hot, sweaty, humid New Orleans in June, it was definitely not on my radar to go. But then I got asked to serve on the national nominating committee for our UUMA (Unitarian Universalist Ministerial Association). And our association’s president, Peter Morales, resigned, causing some anxiety. Then our director of the ministerial association, Don Southworth, resigned, which caused more anxiety. Then our moderator, Jim Key, died of cancer. This caused much sadness. It seemed that if I was going to step into this leadership role with some experience I should go to New Orleans and meet people where we are, in all of our sadness and anxiety. People were very kind to each other, and everyone who had positions to speak were on the same page, same message, different experiences. And that message is clear: We are in a unique position to help with the dismantling of white supremacist systems and so we should and so we shall. The change that we are experiencing is a growth in the depths of our honesty with ourselves and each other. It means listening more than speaking. It means looking for who is not there and bringing them into the conversation. Just think of how ridiculous those pictures are of old white men sitting around a table deciding how women’s health issues should be handled. Now imagine any group of dominant culture people making decisions for people of color or not in the majority. That is what we need to understand, how our systems have been holding us back, and we have the power to change them! Growing pains are real, and not fun or pleasant to be tangled up with. But, done right, growth and change are worth it. Come with me as I discover how to be a minister in this changing landscape, and stay with me to do the work. How much richer we will be for it.